What if a company dedicated to producing driver’s cars built an electric model? It’s a question that we have been eagerly waiting to answer, and now thanks to BMW we can. The i3 has been designed from the outset to be an electric car and this singularity of thought runs right through it. Rather than adapt BMW principles to electric propulsion, BMW has ensured that the i3 is true to the badge. Any doubt that BMW hasn’t taken this exercise seriously and is just launching electric cars because it has to can be instantly dismissed. For starters there is the new sub brand ‘i’, then there are incredibly high-tech materials everywhere and a completely new design language. This all adds up to a very substantial investment, not a token effort. The body is entirely made of CFRP (Carbon Fibre Reinforced Plastic) which is the first time that this material has been used to mass produce a car. It offers most of the benefits of carbon fibre but is much quicker (and cheaper) to produce. This combined with extensive use of aluminium and magnesium explains how the i3 weighs less than a 1 Series, which is a breakthrough achievement for a fully electric car. Incidentally, the CFRP is produced using 100% hydroelectric power in the US and the assembly plant in Germany is 100% wind powered, demonstrating further the lengths that BMW has gone to consider every stage of an i3’s life. 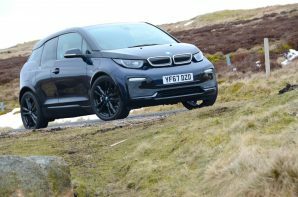 The low kerb weight afforded by CFRP combined with a 170 bhp motor equals excellent straight line pace and great efficiency which sets the i3 apart from electric rivals, and is combined with a typical BMW rear-wheel drive chassis. There are three driving modes to optimise range or pace, which allows an official WLTP range of 192 miles (214 miles NEDC) and a real world range of between 150 – 192 miles. The i3 suffers less of a drop in winter range than most electric cars thanks to optimised interior heating and advanced battery management. The i3 proves that electric cars can be desirable and can be designed to appeal to drivers. In the context of BMW models it is even good value costing less than the majority of the 1 Series range whilst offering interior space comparable to a 3 Series. The electric car has truly come of age.